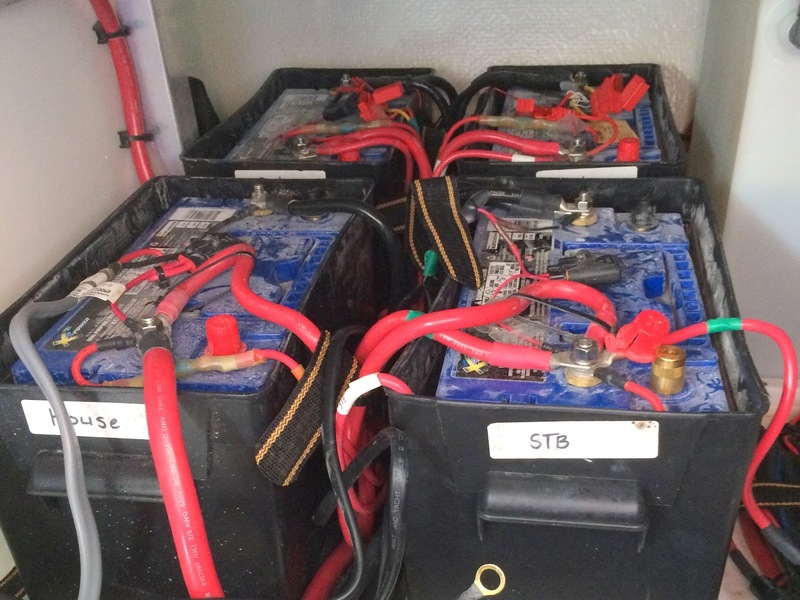 Can boat batteries shock you? The answer is yes and I can in an empirical way say this is the truth. The way you can test this is on a stinking hot humid day in Florida whilst in the bowels of the boat sweating like a pig have your wet arm come in contact with the positive and negative battery terminals. Will this kill you? No! Will the shock hurt you? Not really. But in a cramped and confined hot space can it startle you causing your head to jerk up smacking the underside of the deck and let the wrench in your hand at the same time bridge the terminals causing notable arcy sparky stuff to briefly happen? Yep I know from personal experience this is very possible, and if there was hydrogen sulfide gas leaking from the batteries at the same time there might be a kaboom. BTW the legal department on the fourth floor reminds me to tell everyone to not try to invent or test ways to have large batteries shock you. If you're going to try this anyway at least make sure you video it and use the revenue to help pay the medical bills. Although the voltage is low the amount of the stored energy is large and the law of unintended circumstances can raise it's ugly head.